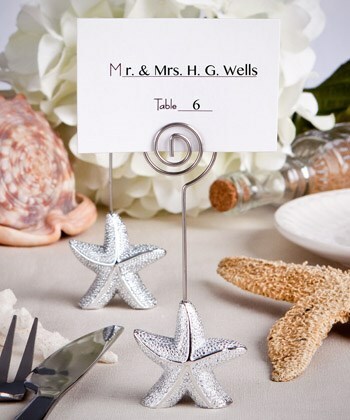 Bring the beauty of the sea to your tables with these shimmering starfish design place card holder favours. Have you ever been on a relaxing walk, combing the beach for treasures when you come across a perfectly shaped starfish on the sand? It’s one of nature’s masterpieces and you can’t help but stop and marvel at its unique beauty and complex design. Borrowed from a little of nature’s magic, capturing the starfish’s beauty and making it last with this place card favour. And, it’s a versatile place card holder too!